Red Mars by Kim Stanley Robinson was published in 1993 so in reading it I was very curious to see how how well the book has aged. I would argue pretty well but especially in terms of Mars itself, the book remains remarkably close to what seems to be the developing understanding of both the planet itself and the feats of engineering required to reach it. Partly I think this comes from the conservative approach to the planet and its exploration. Right off the bat, Robinson takes the very measured and, even today defensible view that Mars does not have and never had life even in microbial forms. While rovers and probes sent to the red planet are increasingly finding evidence of a warmer, wetter past, the evidence for carbon based life is highly debatable. More on that later. Looking back to 1993, it's interesting to see how the book was received given the views about space exploration common to the time. The book would have been written primarily during the first Bush administration and one of H.W. 's biggest efforts to confront the "vision thing," was a massive effort to interplanetary space exploration. The plans were very ambitious: an international space station, a return to the Moon (permanently) and an eventual push to land a man on Mars. Check out this video for cheesy sub-Babylon 5 CGI and quick summation of the rhetoric of the time. Sorry about the audio quality. Now more than twenty years later, what we have is a space station. Partly this resulted from a very discouraging figure that came out of budget analysis of the proposed Mars mission. With the expected cost structure of NASA, any trip to the fourth planet was expected to run to $450 billion. Even during the relatively profligate early 90s, this was a monstrous sum of money and one that quickly drove the agency to shelve much of the mission. 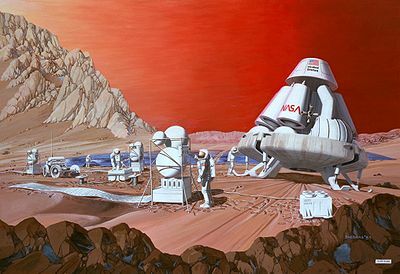 The Clinton administration merely presided over the funeral of the Mars mission by scrapping everything but the ISS. NASA drifted for nearly a decade until 2003 when the second shuttle disaster kick-started the second Bush to propose a new Mars initiative. I am not one to casually give W praise and I'm not going to start now. His typically feckless directives did little to make a Mars mission reality. I'm not sure it was ever anything other than a useful publicity stunt anyway: Look people I'm not all about death and taxes! I like space too! The Obama administration largely abandoned Bush's Moon plans and redirected NASA to land on an asteroid in preparation for a mission to Mars in the 2030s. I like Obama, voted for the guy, but this plan is not serious. Take a look at Mars Direct for a vision of space exploration that gets us to Mars now with existing technology without busting the budget. Better yet, look at the various companies like Space X for a look at how Americans are most likely going to reach the other planets. Travel to other planets has to be cheap and its has to be ready in the next decade; anything else is just media-bait. Elon Musk's interview with Wired seemed to me particularly encouraging but I'm sucker for this kind of thing. Back to Red Mars. Once you take in the sketch of the past two decades, it's clear how the vision of Martian exploration Robinson described went off the rails. After a few days of reflection, the novel's connection to the time it was written is more clear. The newly ascendent American superpower of 1993, vanquisher of communism, liberator of Kuwait, makes a strong appearance in this book. It's clear Robinson expected American supremacy to go unchallenged for considerably longer, and that big government support of the space program would survive into a second Bush term. I was also curious about the Mars Robinson described. How has that fared? This has been arguably more prescient. As I said, Robinson is nothing if not cautious in his portrayal of Mars. He essentially took the barren lifeless view of Mars the Viking Landers presented and made it canon. This is actually a bold move and a risky artistic choice if you think about it. Not three years after Red Mars, the Allen Hills meteorite find seemed to suggest that 3.6 billion years ago Mars had bacteria on it. I think the consensus never really formed around that interpretation however. Neither Opportunity or Spirit found much supporting ancient Martian life. The anomalous carbon or chlorine sample aside, Curiosity hasn't dredged up much evidence yet either. So, Robinson's view of a lifeless rust desert has weathered quite well. 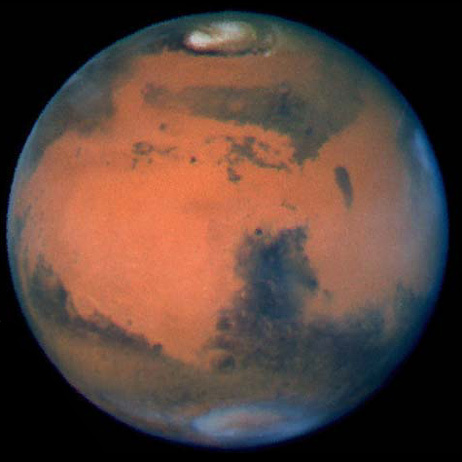 I'll devote more space to Terraforming in another post but I'll close my look back at Red Mars by referencing a recent article from the Chinese space agency. It's clear that America isn't the only game in town anymore. As NASA suggests, any trip there with American astronauts will have to be multi-national in character. That is not the case with the Chinese, they seem bent on leaving the gravity well on their own by any means necessary. The rise of China is one of the aspects of the geopolitics of Red Mars Robinson most clearly missed the boat on.